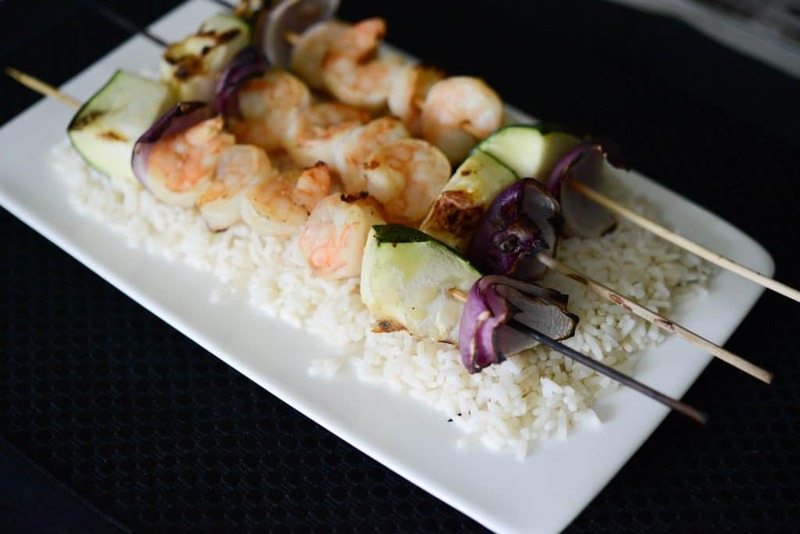 Dijon Maple Grilled Shrimp Skewers are marinated in maple syrup and Dijon mustard; then skewered with fresh garden vegetables and grilled to perfection. I know I don’t make seafood often enough here on the blog and most of you know it’s because I don’t like or eat any type of seafood; which is why every now and then I’ll do a round up post entitled Seafood Frenzy Friday where I find seafood recipes from my blogging friends. However, my family loves grilled shrimp in the summertime so I came up with this recipe for Dijon Maple Grilled Shrimp Skewers. The marinade for this recipe is super simple to make and only contains three ingredients: shrimp, maple syrup and Dijon mustard. I know fresh is always best, but I prefer to use the frozen raw, peeled and deveined shrimp. For us, it just makes more sense since I don’t usually go the store thinking “I’m going to make shrimp today.” I tend to buy the frozen 2lb. bags when they go on sale at my grocery store so I can pull out and defrost just what I need. It only takes about 10-15 minutes to defrost the frozen shrimp. Place the frozen shrimp in a bowl and add cold water. Allow it to sit for 3-5 minutes; then drain the water and fill the bowl back up with cold water for the second time. Drain the water again; then you can remove the shell and tail. I like to take a small paring knife and just check to make sure that all of the shrimp have been deveined properly; then I rinse them gently under cold water and pat them dry. Next it’s time to make the marinade. Combine the Dijon mustard and the maple syrup with a whisk; then add the marinade and the shrimp to a resealable plastic bag or a covered bowl and refrigerate at least 2 hours up to overnight. About 1/2 hour before you are ready to grill, soak your skewers in water if you’re using the bamboo wooden kind like I did. If you have metal ones, there is no need. 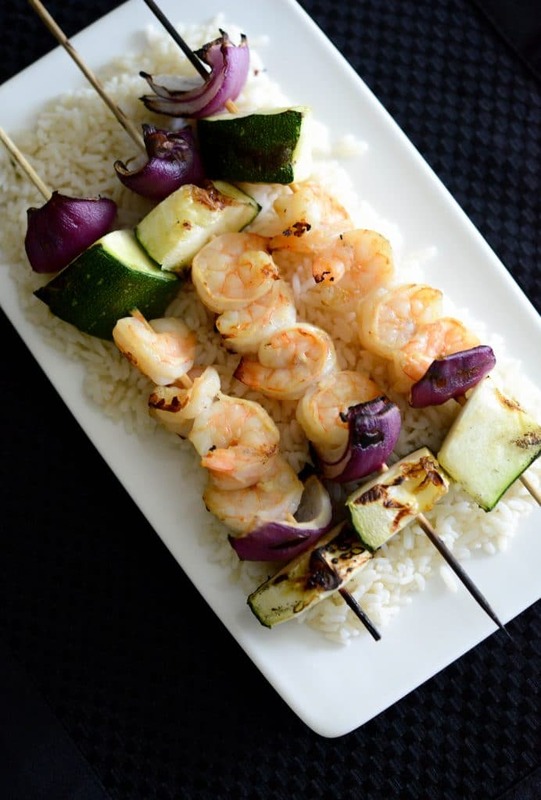 While the skewers are soaking, prepare your shrimp skewers. Cut some of your favorite garden vegetables in large pieces like zucchini, onions, mushrooms, tomatoes, etc. Which ever vegetables you prefer is fine. When the vegetables are cut assemble the shrimp and vegetables onto the skewers and grill until the shrimp are cooked through and are not translucent. Depending on how high you cook on your grill this could be anywhere from 5-10 minutes. Now I can’t say first hand how they tasted, but I can tell you that between my husband and two daughters, they ate everything and said it was delicious. I served our Dijon Maple Grilled Shrimp Skewers with rice for them and I made myself a chicken skewer using the same marinade. ~Enjoy! Combine the Dijon mustard and the maple syrup with a whisk in a small bowl; then add the marinade and the shrimp to a resealable plastic bag or a covered bowl and refrigerate at least 2 hours up to overnight. About 1/2 hour before you are ready to grill, soak your skewers in water if you're using the wooden kind. If you have metal skewers, there is no need to soak. 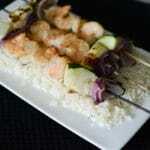 While the skewers are soaking, prepare your shrimp skewers. Cut some of your favorite garden vegetables in large pieces like zucchini, onions, mushrooms, tomatoes, etc. 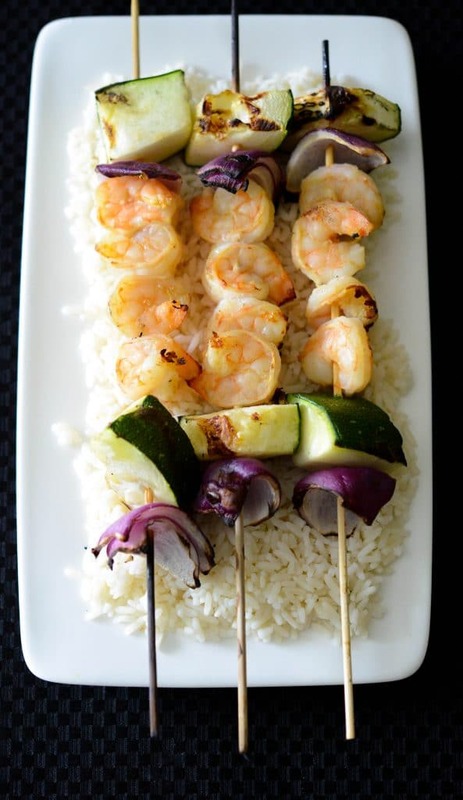 When the vegetables are cut assemble the shrimp and vegetables onto the skewers and grill until the shrimp are cooked through and are not translucent. Depending on how high of a temperature you cook on your grill this could be anywhere from 5-10 minutes. If you want to stay up to date on all of my latest recipe experiments, sign up for my weekly newsletter or you can visit the recipe index and search for more recipes by categories. 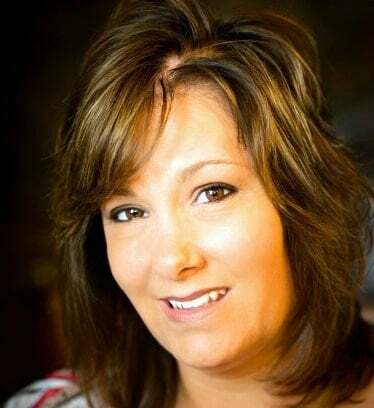 And don’t forget to visit me on Facebook, Twitter,Pinterest and Instagram too! Disclosure: This post contains Amazon affiliate links where I will receive monetary compensation if you decide to click on that link and purchase those particular items.